I just recently began following a blog that is all about a family's journey into healthy food and lifestyle choices. My Whole Food Life is a beautiful and inspirational site. The blog author, Melissa, really caught my attention and sucked me in with her many posts on homemade versions of Larabars. (Her Coconut Cream version sounds amazing, too!) I immediately began following her on Facebook so that I could keep up with all of her future posts surrounding healthier foods and "clean" eating. This recipe uses just three ingredients (not counting the salt and water). I was inspired by her bar version, but turned mine into little bite-size balls that would be easier to snack on while on the go (hello, kids' baseball season). This is a super healthful snack to have on hand ... and you'll be happy knowing you are eating (and feeding those you love) something unprocessed and free of all of the yucky stuff found in most supermarket snack food. Pulse the peanuts and salt in a food processor until a course meal is formed (it should be somewhat powdery with very small peanut pieces remaining). Add in the dates and pulse until a sticky "dough" forms. Add in 2 - 3 tablespoons of water as you pulse (if needed) to bring the "dough" together. Transfer mixture to a medium mixing bowl. Blend in the chocolate chips with a spoon until equally incorporated. If the mixture seems a little warm or way too sticky (due to the length of time in the food processor), allow the chill in the freezer for about five minutes. The dough will be slightly sticky, but should hold its shape well once pressed. 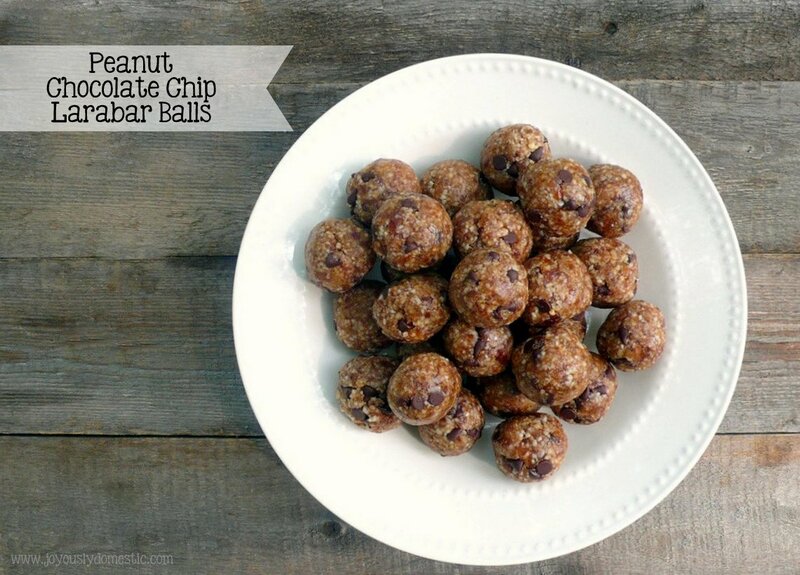 Form into balls using your hands - about 1 tablespoon's worth each. Allow to set up in the refrigerator for 1 - 2 hours prior to serving. Store in fridge for up to a week. NOTE: I have read that raisins might be a good substitute for the dates if you don't care for dates. However, I have not tried this recipe using raisins. (Other dried fruits may work, too, but watch out for added sugar and preservatives.) Also, if a sensitivity to peanuts is present in your home, you could try other types of unsalted nuts. These look great! I love homemade larabars.